This semester more than 400 students will participate in the college’s newest, high-impact signature program—the Live Strategy Case Competition. The competition occurs every semester as the culmination of MNGT 481 Strategic Management—the required upper-level capstone course for seniors studying business administration, accounting and e-business. Students across all sections are divided into teams to conduct research and prepare their solutions over the course of three weeks before the winning team from each section presented to a panel of judges form the company presenting this case. SECU Maryland is the presenting case company and partner for this academic year. 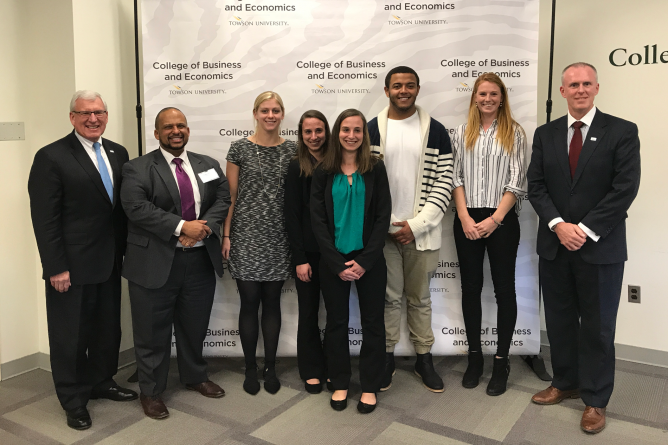 This past fall, CBE management faculty members worked with SECU to develop the case, which challenged students to conduct internal and external analyses and proposes tactics to grow the credit union’s membership base, particularly among millennials. SECU also awarded a total of $2,500 for the top three teams. McGraw Hill Higher Education, which sponsored the event, offered $1,000 for the winning team. The TU bookstore donated printing services to the final teams to print their presentation materials and final reports for the judges. SECU representatives said they have been continually impressed with both the solutions presented by students as well as their professional delivery.